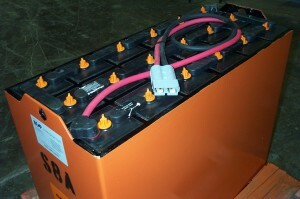 Poorly maintained batteries decrease the life and performance of a battery, increase potential safety hazards and can damage a lift truck’s electronic components. Over-watering, under watering, overcharging, under-charging, accumulation of residue and corrosion of battery cables and terminals can greatly decrease the capacity of your batteries. Acid Adjustment – During operation, battery electrolyte levels can get out of balance through evaporation or over-filling of the battery cells. If the electrolyte is not at the optimal mixture, our service technicians will make an adjustment to bring each cell to the appropriate specific gravity. This adjustment allows for the battery to work at its peak efficiency. Capacity Test – A capacity test is performed by our technicians when a battery is placed under its rated load. Cell voltages are recorded hourly to plot the rate of discharge related to opposing cells. If one or a few cells degrade faster than the average, those cells may need to be replaced. The capacity test gives a written report detailing how the battery will perform under its rated load. Cell Replacement – MCP keeps an inventory of standard sized cells and can make cell replacements quickly and effectively. If your battery is in need of cell replacement, it can be completed in our local shop in a timely manner. 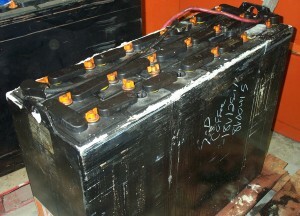 Battery Cleaning – Battery cleaning is provided to remove any residue from the top of the battery. This residue is conductive and can create a electrical path to the metal housing of your battery. This situation can cause your lift-truck controller to become damaged or receive false electrical signals resulting in unusual equipment behavior. Cleaning the battery will eliminate the chance of stray electric signals. Painting – Painting the battery does more that provide a good appearance for your equipment. Removing rust accumulated on the battery case will reduce the chance of structural problems with your battery.